We are H Johnson & Sons Funeral Directors on Ralph’s Wife’s Lane in Banks. 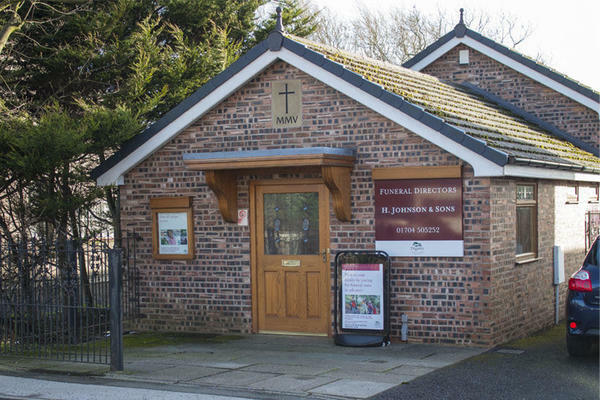 For over a century, we have made the lives of the families of the Southport community a little easier when organising a funeral service for a loved one. You can rely on us to be there. Our funeral home is purpose built, with your comfort in mind, so you can put your trust in us to ensure you and your loved one will be treated with the utmost respect and quality. We believe life with those we love is deeply personal, which is why we will tailor every aspect of the day and service to suit all your needs. It is our aim to ensure the funeral service is beautifully organised and pays tribute to the way your loved one lived their life. We have experience in catering for all types of funerals, so no matter what your preference or belief is we will arrange a fitting funeral. For your ease, we are located close to Hundred End, Mere Brow, Tarleton and Hesketh Bank and just down the road from Ribble Estuary National Nature Reserve. We are here to help you at all time, from our funeral home in Banks and our other H Johnson Funeral Directors in Churchtown, Southport. You can call us 24 hours a day, and a member of our team will be there to assist you every step of the way. Call us today on 01704 505252 to talk through your personal requirements. At H Johnson & Sons Funeral Directors, we understand how special life is with those that you love. For us, every funeral is unique and personal. We have a service to fulfil every wish, with every detail carried out with the same uncompromising quality of care. From a traditional service, to a colourful woodland burial, your options are limitless with our Full Service Funeral. If you have a little more flexibility when it comes to arrangements, then we can provide a Simple Funeral for a lower cost. There is free parking at our funeral home, and along Ralph's Wifes Lane. You can find us opposite St. Stephen's Church. Our staff are available 24 hours a day on 01704 505252 if you require our services outside of these hours.